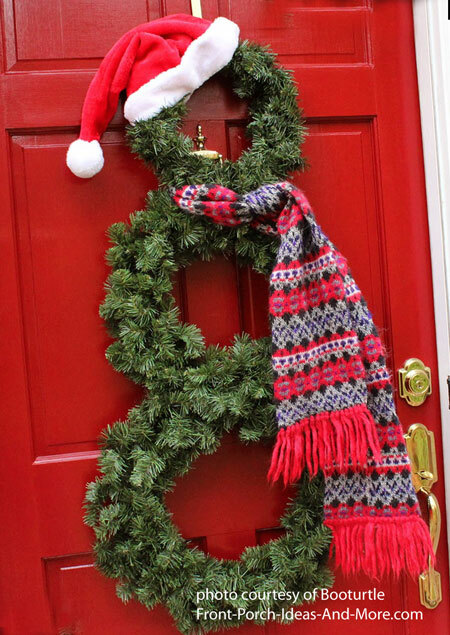 Our instructions for making Christmas wreaths for your home and front porch are easy and fun. It's often said that if you can only afford one Christmas decoration for your front porch, make it a wreath! We found a few unique Christmas wreaths we know you will enjoy making. 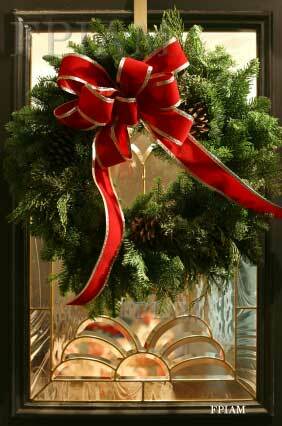 Wreaths brighten the season, have true curb appeal, and range from very simple to really elegant. Looking for something you can do with your family or friends on a December afternoon? 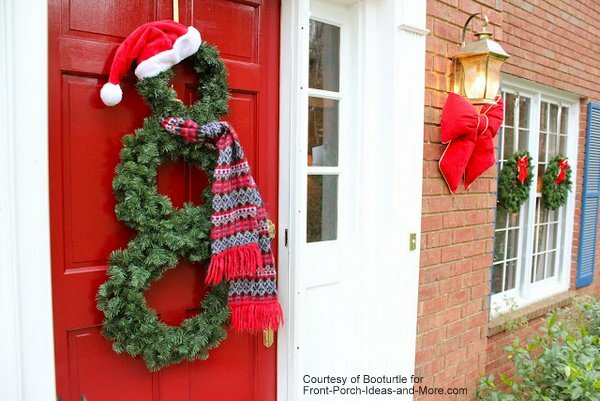 Making wreaths is a perfect activity to dress up your porch. Christmas wreath making isn't limited to the front door. 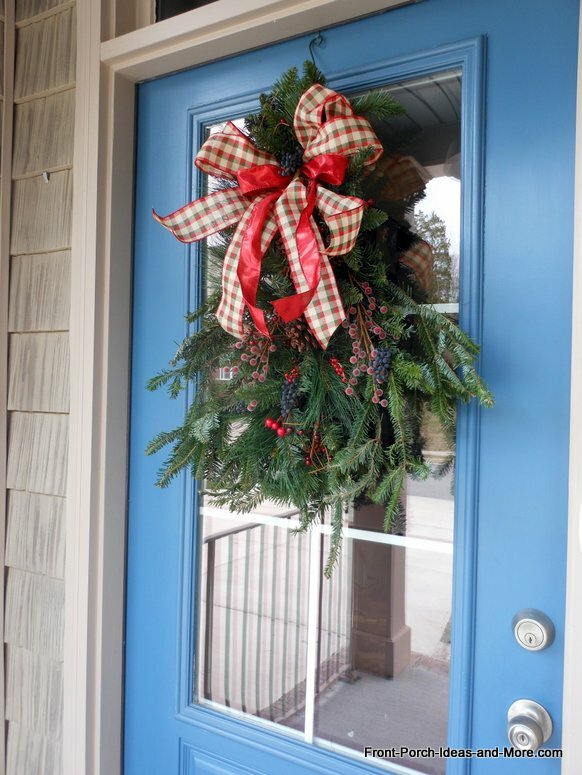 Wreaths can be hung over the railings, attached to columns, and placed on porch windows. 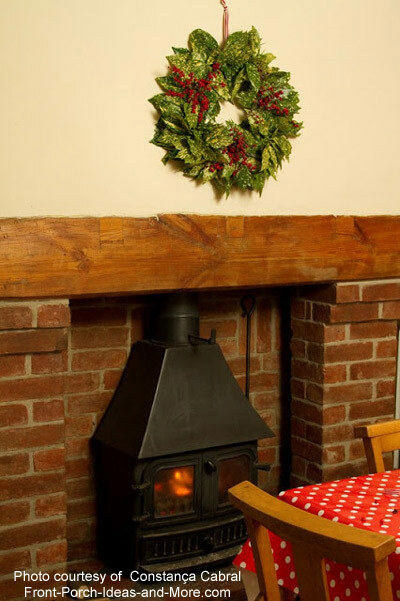 Using our instructions for making Christmas wreaths, you can make stunning displays across the length your porch. 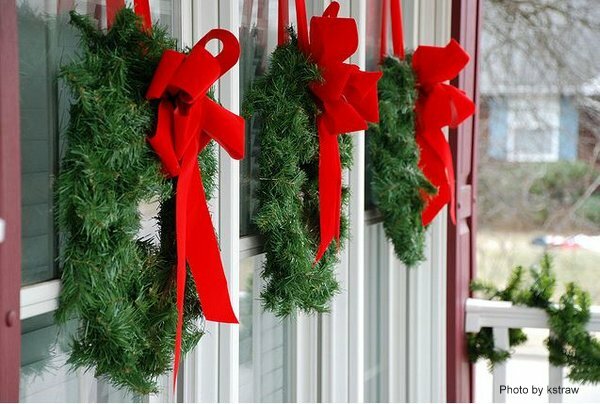 You can color coordinate the wreaths with your home or porch's color to add wonderful curb appeal this season. There's nothing more pleasing than using natural materials at Christmas. 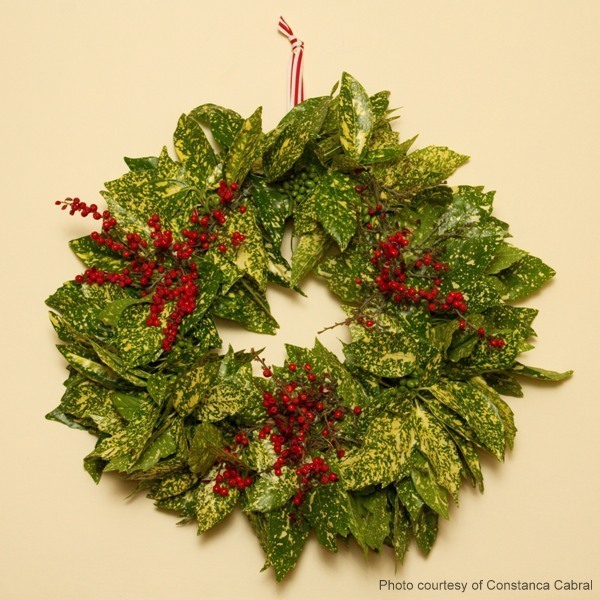 Constanca of Creative Homemaking with Constanca Cabral graciously shows us how to make this natural wreath for the holidays. Using materials directly from her own garden, Constanca creates the most welcoming Christmas decorations. We've taken the liberty to summarize Constanca's instructions for making Christmas wreaths. Constanca advises to have a large work surface that is protected from both water and soil before beginning. Assemble the materials listed below although you may decide not to use all of them. 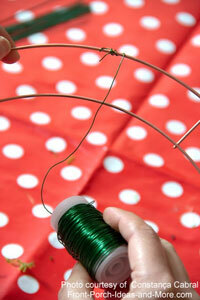 Start by attaching one end of the thin wire to the outer ring as shown below. 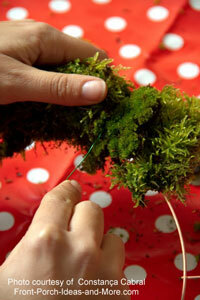 Then begin attaching moss by slightly overlapping each piece and pulling the wire tight as you make your way around the wire frame. 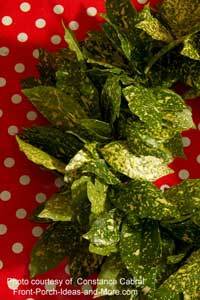 Begin attaching your selected foliage to the wreath frame as shown below. 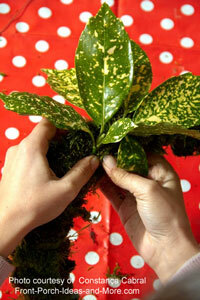 Cut lengths of wire and bend into U-shapes to attach gathered bunches of foliage. Twist the ends and tuck then in the back of the wreath. Attach berries, pine cones, poinsettias, mistletoe, fruit,or other natural items you've collected around the wreath equidistant apart. 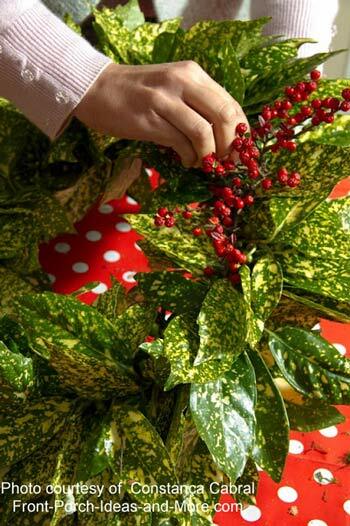 Inspect the wreath to ensure there are no gaps and add additional foliage as necessary. 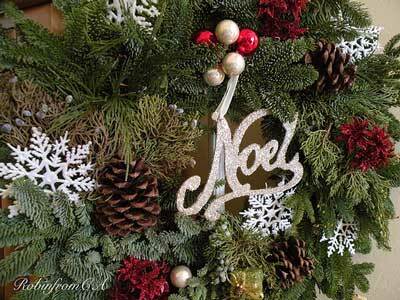 Attach a ribbon or cord to the back of the wreath on the frame's outer ring. Hang and enjoy! 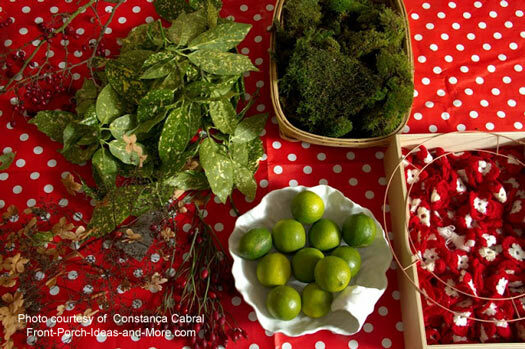 Our special thanks to Constanca Cabral for sharing her instructions for making Christmas wreaths the natural way. Please visit her blog, Creative Homemaking with Constanca Cabral for more ideas. He uses natural berries from his yard like crab apples, china berries, beauty berries and pepper berries. He finished it up with eucalyptus buds. Looks easy yet elegant. This short video shows you how to make a natural berry wreath. We appreciate Booturtle of Show and Tell blog allowing us to feature her fun and easy snowman wreath. Mary and I like it because it would be a fun family project, it uses relatively inexpensive items, and you could easily enhance it with other decorative items - or not! Start with three wreaths of different sizes, small, medium, and large as depicted in the photo above. 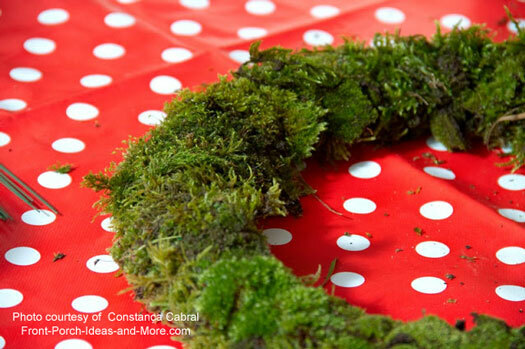 You can use either natural or faux wreaths. 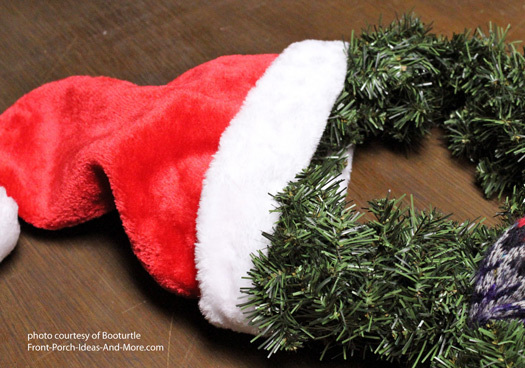 We recommend using faux wreaths like Booturtle so you can display your snowman wreath for years to come. If you like to be a bit frugal, purchase your wreaths after the season to take advantage of sales. 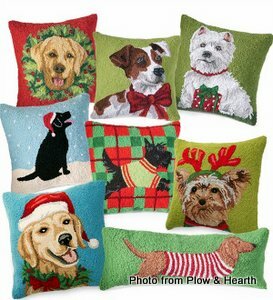 We like to shop at our local dollar store as they often have a variety of inexpensive decorating and craft items. 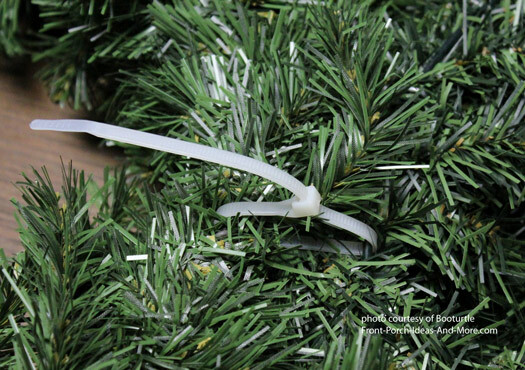 Attach your three wreaths with zip ties (or string, cord, wire) as shown below. 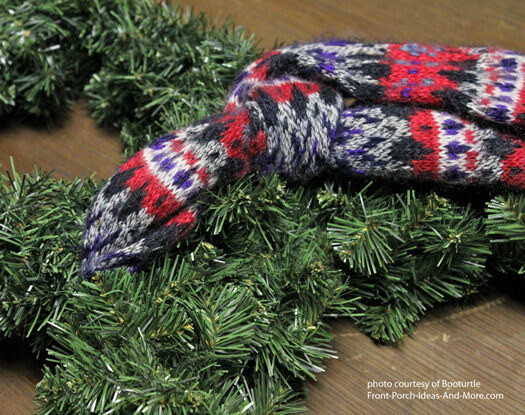 Use an old scarf or find one at a thrift store to tie onto your snowman as shown. Choose one with bright cheerful colors! Booturtle used one of her Santa hats but also points out you can use different types like fedoras, top hats, or others. She suggested you can fill the Santa hat with plastic bags but she preferred a "floppy appeal". Ready to hang - it's that easy and it adds lot of curb appeal. You can also add other decorative items like sticks decked out with mittens for the snowman's arms. How about hanging a ribbon down the center and attaching bright red buttons? We really appreciate Booturtle allowing us to share her snowman wreath. Please visit Booturtle's blog at Show and Tell blog. 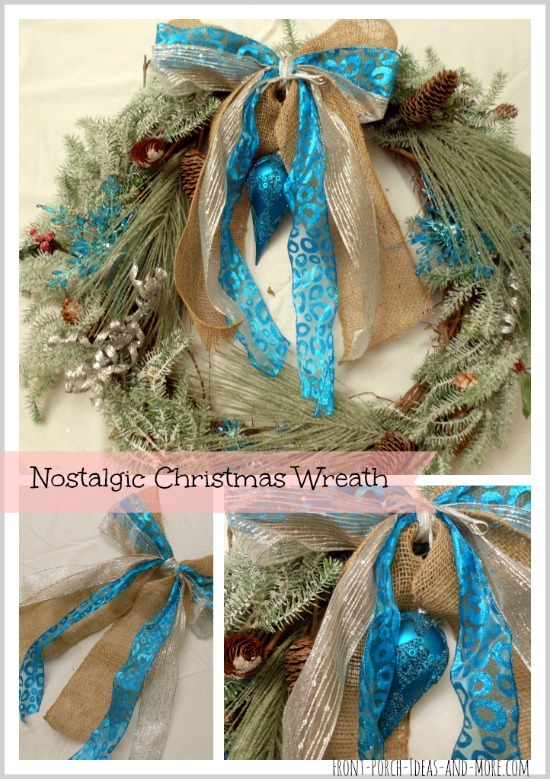 Do you already have wreaths in your closet or attic? Mary and I do and we want them to look fresh each year. We found these instructions that can help you do the same! Dave and I took a walk in the woods and found some beautiful berries we could add to fresh greenery to make this wreath for our front door. See the picture and instructions for our DIY wreath - it was easy! Then it was a simple as adding a pretty bow to this fresh "swag" for our front door. The best part? It stayed fresh looking through January. When I made our blue Christmas wreath from a grapevine base and greenery, I found that the secret was more in the materials than in the method. Take a look at this vintage-style Christmas wreath we made for our front door. We include a step-by-step tutorial for you. Gather your materials first. Use old Christmas tree ornaments, natural materials like twigs, pine cones, and berries, and ribbon, etc. Decide on your base material - grape vine, straw, synthetic, etc. Gather your tools. Most wreath making will require thin wire, snips, pliers, scissors, and hot glue gun. Find a workspace where you can lay out your materials and access your tools easily. Dry fit your wreath, that is, lay it out so you can envision the end result without fastening anything to the base. That way, you'll know if you have enough materials, the right decorations, and the right design. Begin fastening the background (major material) to the base. Add the decorations and finish with the bow if applicable. We hope you enjoyed these instructions for making wreaths. 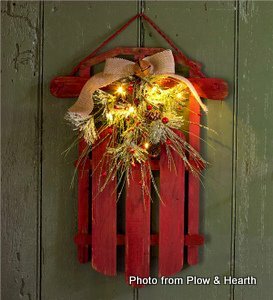 Sweet advent cabin and pine cone berry wreath from Plow and Hearth. 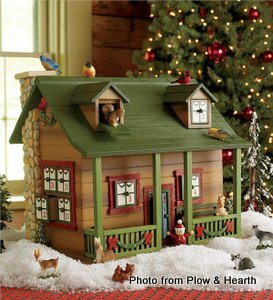 This lighted holiday sled decoration would be an adorable decoration on the front porch. 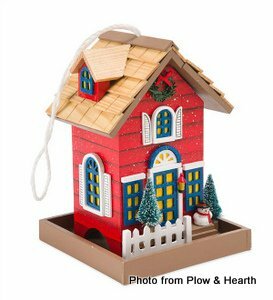 And if you feed birds like Dave and I do, we bet you will enjoy this cute cottage bird feeder from Plow and Hearth. Dog lover? Cat lover? 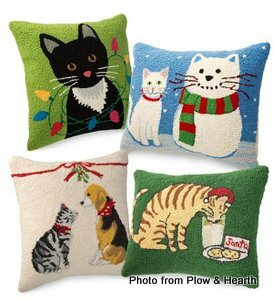 These lovable hand-hooked dog pillows and cat pillows make an absolutely wonderful gift from Plow and Hearth. 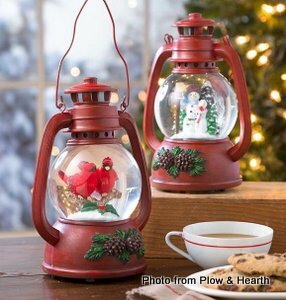 Nothing as nostalgic as this musical Christmas lantern and snow globe. Plays eight Christmas carols and changes light colors. So enchanting! 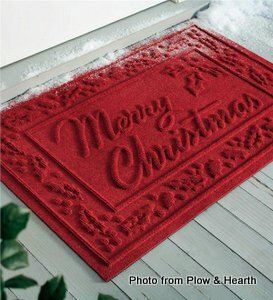 And as pretty and cheerful as this Christmas doormat is, did you know it will hold up to 1 gallon of water? Great for snowy boots. Both are from Plow and Hearth. Find ideas you can use this holiday season. 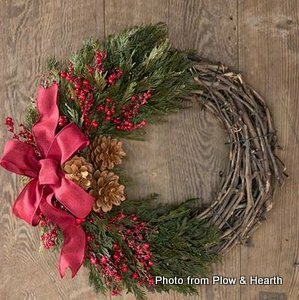 Find the perfect wreath to help celebrate the holiday season.